How Good is Your Retirement Plan Advisor? Ask Seven Questions. In order to obtain a new card, you need to prove your citizenship or lawful noncitizen status, and your age and identity from a list of approved documentation (e.g., U.S. passport, driver’s license, birth certificate). All documentation provided must be either original or in certified form (notarized copies or photocopies will not be accepted). Next, you need to fill out an Application for a Social Security Card and bring or mail the application, along with the approved documentation, to your local Social Security office. Once the Social Security Administration (SSA) has your information and verified your documents, you should receive a replacement card within 10 to 14 business days. 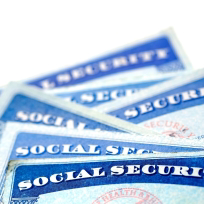 Be wary of businesses that offer to replace your Social Security card for a fee. The SSA provides those services free of charge. Keep in mind that you are limited to three replacement cards in a year and 10 during your lifetime, although certain exceptions apply. For more information on replacing a lost or stolen card, visit the Social Security Administration website at ssa.gov. ← Do I need to get a REAL ID when I renew my license? Wellspring Financial Partners provides financial and investment advice to both individuals as well as companies that sponsor retirement plans for their employees. Wellspring is focused entirely on our clients' financial well-being.